Have you ever noticed how much easier it is to shuck corn after it’s cooked? This is a not-so-subtle nudge to those who insist on shucking it before buying it, a habit the Accidental Locavore heartily condemns! While many a summer childhood was spent shucking corn before it was dumped into a big pot of boiling water, in later years, I’ve learned there are almost as many ways to cook corn as there are varieties of corn. The traditional pot of boiling water (good for a crowd, but not my favorite method) has a few new twists, none of which I’ve personally tried, but all of which have their champions. One, recently touted on HuffPost’s Kitchen Daily (got to plug it since I’ve been posting for them! 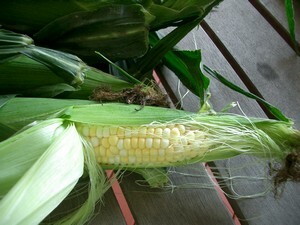 ), said to bring a pot of water to a boil, add the shucked corn, bring to a boil again, and let sit until ready to serve. Another party-friendly twist is to put the corn (shucked), in the bottom of a cooler, pour boiling water over it, cover and let sit. 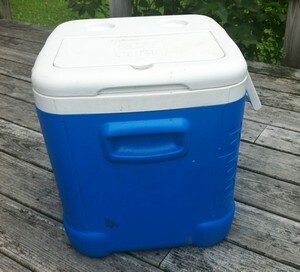 This requires a cooler, the kind that can take a gallon or two of boiling water, a piece of equipment the Locavore doesn’t have. Keeping (sort of) on the steaming/boiling trail, the next way, one of my favorites, is to cook it in the microwave. I cut the stem end of the corn close to the cob, peel off the outer layer or two of the husk, and microwave for 1-2 minutes an ear, depending on the size and number of ears and the strength of your microwave. To see if corn is cooked, peel back a little of the husk. The corn should have lost its opaque luster and the kernels should be bright and almost shiny. My favorite way to cook corn is simply to toss it on the grill, husk and all. We often just put it on when the grill is heating up and let it roast over on a corner, while grilling the rest of the meal. You’ll want to turn it occasionally, but not too often, as it’s better when it gets a little browned in spots. For any of these methods, if you really want to show off, take a blow torch to the corn after it’s cooked and shucked. This is a trick I learned from my friend Kerry at Cafe Miranda. It browns the kernels, making them taste like popcorn, and will either scare or impress all of your guests! What’s your favorite way to cook corn? WAY cool that Kerry gives you tricks — I’m buying blow torches for two of my best friends! Sooooo much easier to shuck after it’s cooked!!!! I never knew you can cook corn pre-shucked. I’m trying it this weekend! Accidental Locavore, Blogging Boomers’ Carnival: Enjoying Summer! Next post: Blogging Boomers’ Carnival: It’s All About Enjoying Summer!